For the Official BB Mitten Project BB performs as a clandestine soothsayer inside a three walled structure. BB is wary of her audience. The project begins at a circular hole in the wall of the structure. The hole in the wall is cut at waist height. Plastic camping water containers and a knitted towel are the only other items on the outer wall. Inscribed in pencil on either side of the hole is a set of Official BB rules, instructions inviting BB’s audience to unwittingly trust her by putting a hand through the hole, embarking on a regime of intimate processes that ultimately lead to the participant’s enjoyment of physical pleasure. 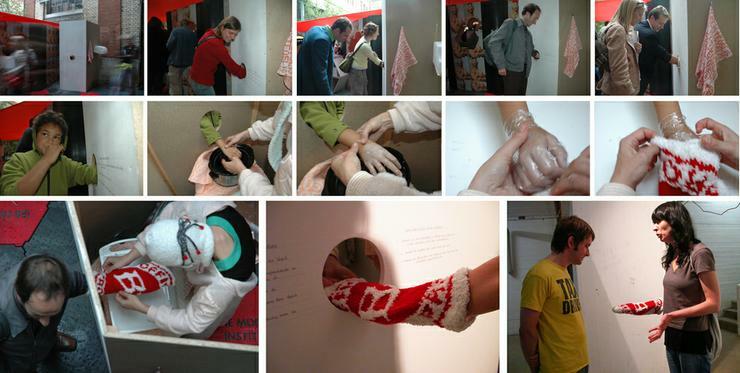 Once the participants have removed their jewellery and washed their hands, they insert a hand into the hole. BB, hidden on the other side of the wall, then subjects her participant’s hand to a therapeutic hot wax treatment, finally gloving the wax covered hand in the trademark Official BB Project mitten, specially handknitted for the occasion. The BB mitt is applied as a catalyst to complete the action and at the same time advertise the BB brand. The participants are then free to interact with other participants in the room while the wax treatment takes effect. After about ten minutes the participants return to the hole in order to get the wax and mitt removed. According to BB wisdom: In life as in art rules are set and when followed explicitly an unexpected amount of pleasure is derived.